This isn’t a full episode, just a short. The nice thing about shorts is they don’t overplay their gimmick. In this piece, Dexter disbelieves in Santa, while DeeDee says he’s real. 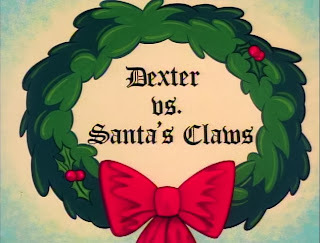 To prove his sister wrong, Dexter sets up a series of elaborate traps to prove that their father is Santa. I, uh, may sympathize with this a little too much. Due to classic cartoon logic, Santa is real, and Dexter ends up chasing him all over town using a rocketship built in their chimney. He’s convinced until the very end that it’s his dad, breaking out the special effects to trick the kids. This ends badly for all involved. It’s not brilliant, but it’s an amusing few minutes. If you want to hunt it down, it's part of Episode 37 in Season two.